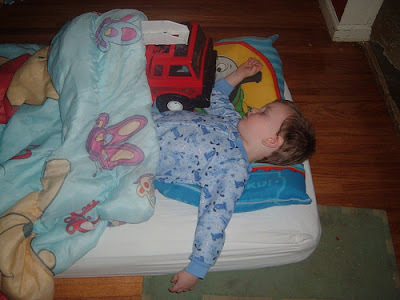 This little guy has actually outgrown those pajamas and they have been passed down to his sister, but his love for that firetruck has not abated. Its name is Lofty. Yeah, he's a Bob the Builder fan, too. I never would have thought to name an automobile, but all of his larger ones have been named...Lofty, Muck, Scrambler...you get the idea. I know of little that is more peaceful than simply watching a child sleep.